Disney Junior Canada to Premiere "Tangled" This Month! Watch the Tangled Movie Premiere on Disney Junior Canada! May is a great month with lots of fun in store, especially now that the weather has gotten warmer! There's a great surprise that we've planned for my mom on Mother's Day, which I'll tell you about a little later. Similarly, my dad has a special Mother's Day planned for my mom, sister-in-law and I! I'm really excited about it! My family is really looking forward to the Victoria Day long weekend, and we may drive to the beach for sun, fun, a picnic, and of course wading up to our ankles (it's Lake Ontario, so no swimming yet)! TANGLED (Premiere) Sat May 18 @ 6:00 pm ET - As a Disney Junior Mom, I'm really excited about the Disney Junior Canada programming for May! I'm especially excited about the Disney Tangled Movie Premiere on Saturday May 18th, 2013 at 6:00pm ET! It's a wonderful film about innocence, trust, independence, friendship and love. Tangled is a story about Rapunzel, a beautiful girl with long, magical hair. She has been locked away in a high tower by Mother Gothel (not her real mother), under the guise of protecting Rapunzel. When Flynn Rider enters the fortress one day, Rapunzel's world is about to change forever--and she will learn many new truths. One of these truths is about whom to trust, and the reality that Mother Gothel is not whom she states she is. 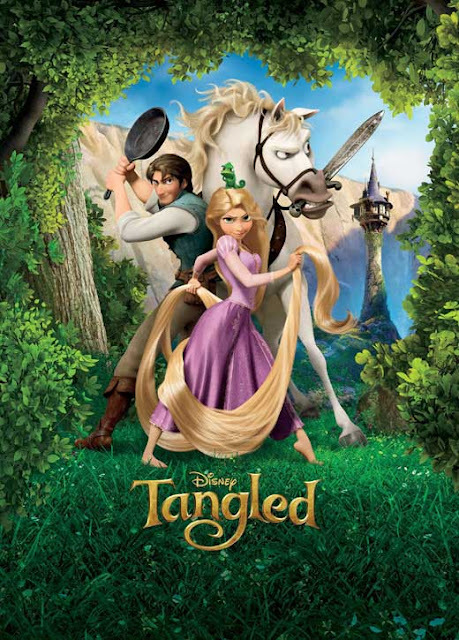 Watch Tangled on Disney Junior Canada with your little ones for a GREAT family movie night! See Our Tangled Rapunzel Hair Recipe, Below! In honour of the Tangled Movie Premiere, my family created this "Tangled Rapunzel Hair Pasta Salad", a healthy, tasty meal to serve the kids during this awesome Disney film presentation! I love that it's easy to make and loaded with delicious veggies! 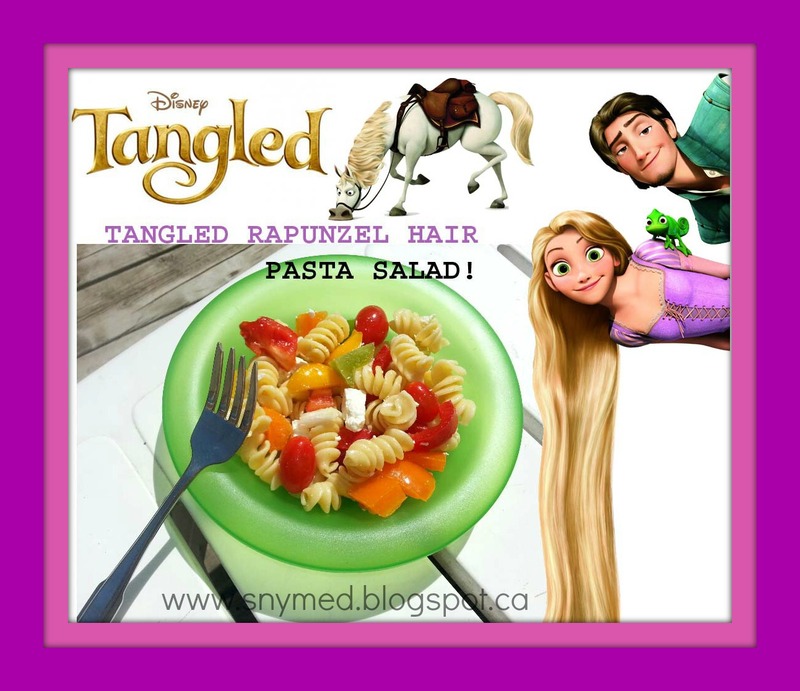 Tangled Rapunzel Hair Pasta Salad Recipe! 1.Cook rotini pasta until firm. Drain and place inside a large serving bowl. 2.Coat rotini fully in extra virgin olive oil. 3.Drop in sliced peppers, whole grape or cherry tomatoes, chopped white onion and crumbled feta cheese. 4.Stir well and serve this pasta salad that's suited even for a princess! *Note: I don't add salt to this recipe, as the feta is sufficiently salty. However, do add salt and pepper to taste, according to your preferences. New Episodes of Sofia the First May 5 & 19th 2013! 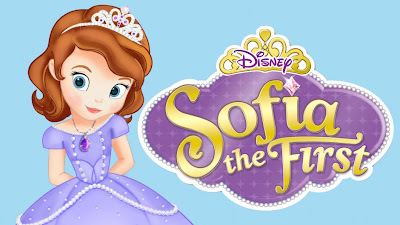 SOFIA the FIRST New Episodes May 5 & 9 @ 11:30am ET - Do you have a little princess or prince who loves Sofia the First? A brand new episode aired on Disney Junior Canada this Sunday May 5th--and another new one will air on Thursday May 19th, 2013 at 11:30am ET! Sun May 5 2013 - The Sofia the First "The Princess Test" episode premiered on Sunday May 5th. In this great episode, Sofia learned what it meant to be a true princess, when she was diverted with a real life "test" on her way to her school! Sun May 19 2013 - Sofia the First "Baileywick's Day Off" episode will premiere on Sunday May 19th, 2013 at 11:30am ET! Poor Baileywick's day-off is cramped by demands made from Sofia, James and Amber--until the royal siblings learn an important lesson in gratitude. Manners are very important in my own family. We teach words of gratitude to our children and ensure that they use them. Sometimes gratitude is hard lesson to grasp for young children, but easier to understand when shown in context. For example, my kids understand that the word "please" comes before a request, such as asking for a dessert. And the phrase "thank you" is used when a request is satisfied--or when an item is given to the child. For example: thank you for the cupcake, birthday gift, or compliment. Mother's Day on Disney Junior Canada - Sunday May 12th, 2013! Disney Junior Canada celebrates Mother's Day with special shows on Sunday May 12th, 2013 starting at 9:00am ET! Read below to see what Mother's Day themed fun is planned for the day! Special Agent Oso 9:00am ET - Eun-Kyung wants to make a handprint for his mom as a Mother's Day gift, but she needs help learning how! Handy Manny 9:30am ET - Manny receives a phoncall from Mr. Lopart's mom to build a mantle for her fireplace. Disappointed that his mom didn't call him, Mr. Lopart follows along with Manny. Jake and the Never Land Pirates 10:00am ET - Don't miss back-to-back episodes of Jake and the Never Land pirates starting at 10:00am EST! Did you know that Mama Hook is voiced by Sharon Osbourne? Tune in for the "Mama Hook Knows Best" episode, in which Captain Hook's mom comes to visit. But Mama Hook is upset when she learns that Hook didn't find the treasure by himself! By the end of the episode, Mama Hook hosts a pirate tea party with Captain Hook, his sailors, and Jake and his crew! Jake and the Never Land Pirates (Premiere) 10:30am ET - Tune in for the brand new "The Mystery Pirate" episode at 10:30am EST! When a mysterious masked pirate takes Jake's sword and Captain Hook's own hook, both crews are sent on a wild goose hunt! Imagine the surprise when they discover that the masked pirate is Mama Hook! But her motive is well-intended: she just wants her son James to learn the art of teamwork in order to become a better pirate! Doc McStuffins 11:00am ET - Lambie gets accidentally caught on Sir Kirby's sword and rips! Doc brings Lambie to "Doctor Mom", who agrees to take on the patient for "surgery". Doc is an excellent assistant, as Mom sews up Lambie as good as new. 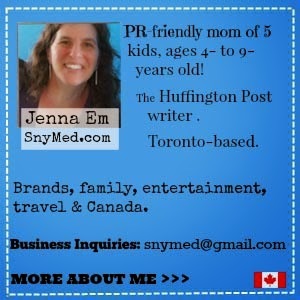 Check Out This "Happy Mother's Day" Video From Disney Junior Canada! Are you planning to tune into Disney's Tangled on Mother's Day? Do you have any special plans on Mother's Day? Tangled is one of my boys favorite movies, and we haven't watched it in awhile so I think we will be tuning in! I love pasta salad, such a great, light meal for the summer time! I don't have Disney JR channel but it looks like I should get it. I loved the Tangled movie! My kids' new fav show is Sophia the first! dd8 came to me just this morning talking about how they are learning about bullies from that show and why it is important to not be one! Disney Jr is always playing such cool shows/movies! Makes me wish I had cable! I wasn't as happy with this as some of Disney's other movies, but I could not have laughed harder at its follow-up short, 'Tangled Ever After"! I wish all Disney movies could have one of those! Tangled is my granddaughters favorite movie.